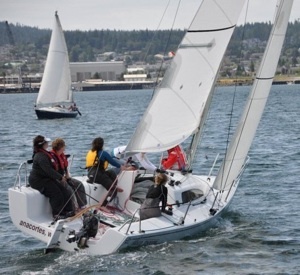 The idea behind the dart was to build a trailerable sailboat that was fun to sail for the entire family. Afternoon sails are not daunting. Just untie it from the dock and go. If its dry stored, getting it launched should be simple enough that it doesn’t stand in the way of a nice daysail. The rudder is removable & the keel lifts for easy trailering. The Dart sleeps four, with an ice chest, LED reading lights. A little bit of storage.. That’s about it, keep things simple. The Dart is fitted with oversize winches. This is so that the kids could deal with the working loads and be able to run the jib sheets etc. And.. If the boat is knocked down? It is self righting and self bailing. All fiberglass parts are vacuum infused using vinyl ester resin. This gives higher strength to weight than standard resins. It also reduces, or possibly eliminates, any blister problems down the line. No structural wood. Structural wood can rot and cause failures. Eliminating structural wood eliminates this potential problem. Now, a little wood here and there for trim purposes? No problem. •Dart build 4 & 5 - Last builds. •Dart tooling - The creation. All of this wouldn’t really count for beans if the machine wasn’t a real kick to sail. After everyone else is comfortable with their Dart features, its your turn to have a good time. Many trailerable sailboats can trace their lineage back to, well.. Camping trailers. They are basically calm water versions of camping trailers. And, many of them sail like, camping trailers. 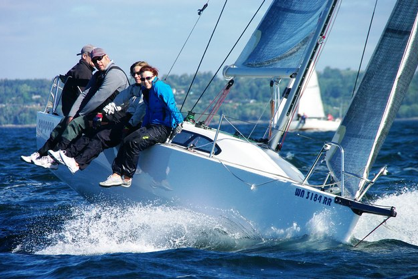 The Dart can trace its linage back to Leif Beiley’s racing sailboats. It is a family day sailer, really it is. But we quietly made sure that there was plenty of stability, using a six foot draft bulb keel. And, plenty of power in the sail rig, along with the appropriate sail controls to manage it. Although you’re taking the family out for a weekend camping trip, its still fun to pass most any sailing craft of the similar size, and many that are larger.